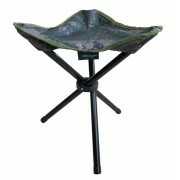 Folding camo stalking stool and carry bag with carrying strap. Sturdy coated steel tripod design, recommended user weight of 15st (100kg) with 14" / 35cm x 13" / 33cm seat section. These Stools will come in handy for many other uses, ideal to leave in the car, caravan etc, quick and easy to use. ..